Image you and your fellow classmates are about to embark on a journey to Canada! Somethings you might need to know is their language, clothing, food, customs, and music can be very different from the USA. Today we are going to discover these things! 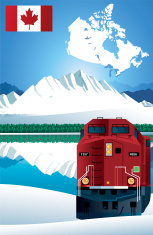 Lets get on the train and learn about Canada.